So I tried to post this earlier…aka last week when it happened, but couldn’t get it to work. HOPEFULLY IT WORKS THIS TIME! By the time Kate and I got to Tracy City on Tuesday all the kids were already outside. 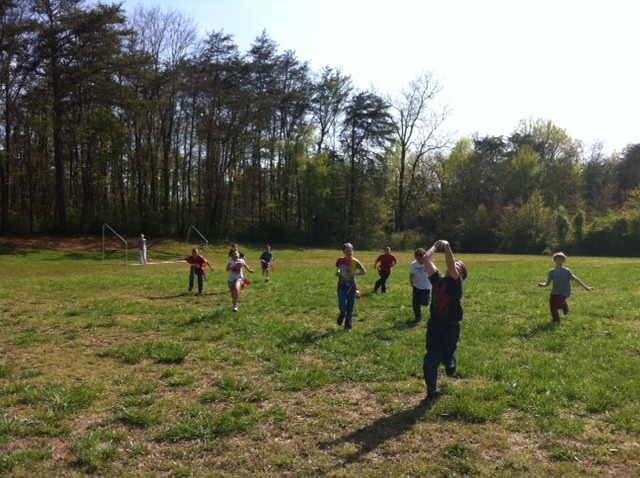 It was an INSANELY gorgeous day, perfect for some outdoors Capture the Flag! (or ball as it was in our case…) We got a couple balls from the gym and some of those flags that clasp around your waste, you know the ones you wear in middle school when you play flag football? 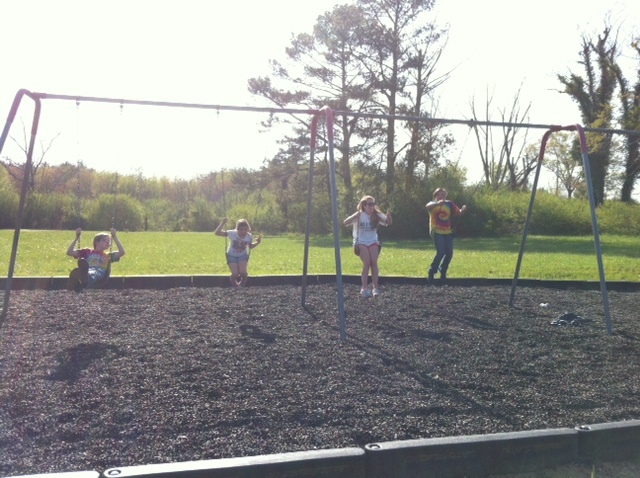 We headed out to the playground, where instead of PLAYing, every kid was just sitting around! Either on the ground, or on the swings (but not swinging…) until Kate and I walked up. Then they all ran to meet us!!! And were yelling “MARY!!! KATE!! YOU’RE HERE!” It was so awesome, they were so excited to see us. Most of them hadn’t heard of Capture the Flag before, so we had to explain it. Of course most didn’t get the point until we started playing. We assigned them to teams 1 and 2, team 1 got the flags–everyone wanted the flags. We started playing: the balls in each soccer goal, if you get tagged you’re in jail. Team 2 (my team) won first-WAHOOOOO! We just kept playing and playing, game after game. They don’t follow rules too well….they kept switching teams and sneaking out of jail to steal the flag…but at least they were moving!!! That’s all we were worried about! That’s my main girl Ally and little Jarien. Then we swung and just talked and sang our favorite songs. They sure do love that country! 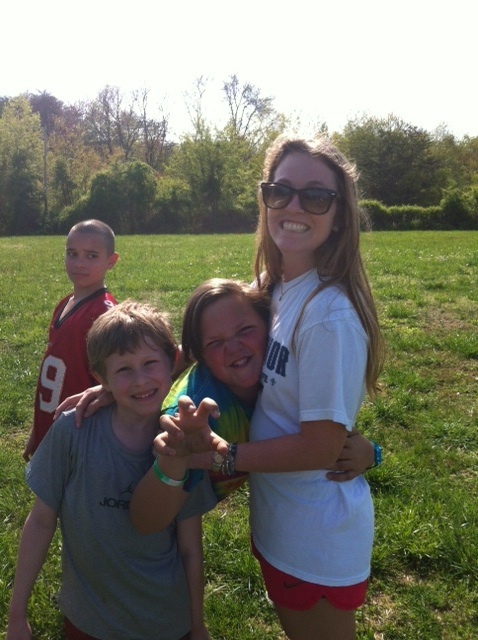 I think Tuesday was the day we taught them “Little Sally Walker” and boy do they love that! And not only the girls, the boys play too! But then we sing “Little Johnny Walker.” We played that a lot Thursday, they can just keep dancing and dancing and never stop! One of the teachers even told us the kids started playing it during recess when we weren’t even there! HOW AWESOME IS THAT?? It feels so great to know they remember what you teach them! Thursday we set up an obstacle course for them-hop to different hula hoops, dribble soccer ball through some cones, jump rope (or jumping jacks) 10 times, then run back! and they LOVED that! They never wanted to stop! We had to up the difficulty and make it LEVEL 2! Bum bum bum…..nevertheless they rocked that too. 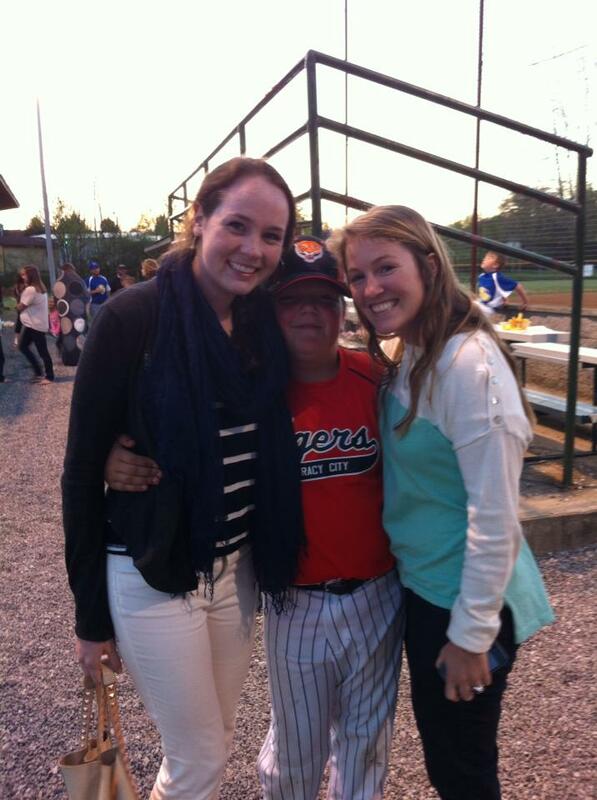 Thursday night was a big night for some of our little cuties…double header baseball game!! We had kids on both teams–so Kate, our friend Margaret, and I all went! Ally drew us the cutest little map with how to get there. Unfortunately we still couldn’t read it, and went to the wrong baseball game first-OOPS! But there we asked someone else to read our map, luckily they could and told us exactly where to go! Ally’s team lost both games, but her best friend, and another kid we know, Austin, his team won both! So it was bittersweet for us. They were SO HAPPY we went to the games though! Made us feel super popular with all the kids yelling after us! We have a quick update on Cindy’s Blow In insulation for her attic. Ian was finally able to set up an appointment when we were all available (Cindy, contractor, audit team), but unfortunately, when we showed up for the appointment, Cindy had gone to the doctor. The contractors arrived before we could cancel the appointment, and we could not get into the house to allow them to install the insulation, but we were able to get a price estimate for about $1300 to have the attic blown with R38 insulation. We are still working with Dixon and Daniel to arrange another appointment. 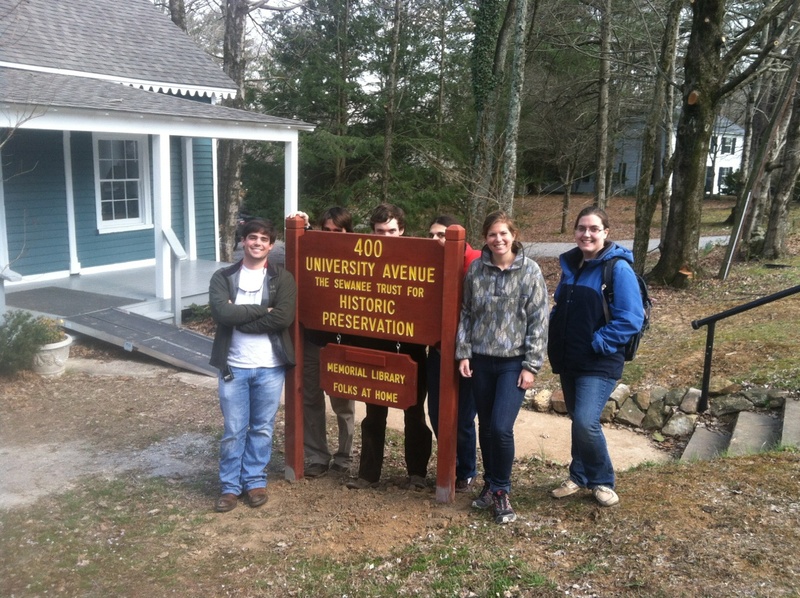 This week, the energy audit crew visited Sewanee’s own Folks at Home. Daniel Church led the group, which included Ben, Drake, Ian, Sega, John, Catherine, and myself. Folks at Home is non-profit organization providing services that allow the elderly to age in the comfort of their own home. The Folks at Home office is located right beside Hunter Hall. Upon our arrival, the F@H director, Kathleen O’Donohue, gave us a brief rundown on where our energy efficiency expertise was most needed. Although a previous audit and some repairs were completed as recently as last year, there are still some areas in dire need of a tune-up. This is not all surprising, given that the Folks at Home office was constructed in 1866! This makes the Folks at Home a historical landmark as well as the third oldest building on campus, behind only Rebel’s Rest and Dr. Potter’s home. We started right away with a door blower test and began caulking the most obvious leaks in windows. We also installed weathering strips under a door and sealed up a gaping hole under the bathroom sink. Unfortunately, our team was supply-limited. We were unable to address other issues simply because we did not have the needed materials. Hopefully, we will be able to return and finish up the feasible aspects of the job, especially installing more weather strips. However, some repairs, such as putting in new windows, may be beyond our current capabilities. Although we did not get to address every possible repair, overall it was a successful audit! This week we visited a second house on Gudger Road. Cindy’s house was just down the street. The residents were an elderly couple, and the man seemed to be nearing the end of his life. His wife was still working and also took care of her husband. She was very open to share her family problems with us, a recurring theme throughout our visits. The house was in so-so condition, which is not surprising to see for an older couple. There was nothing horribly wrong. It was just clear that they were not physically able to repair the house, and may lack money to pay for repairs. Gutters were falling apart and their garage door had a broken window. She related that one of her children was too busy to help, and the other one had debilitating health problems. We set up the blower door and found a few leaks, but overall the house was pretty tight. John and Elizabeth caulked some things in the bathroom. I was going to turn their hot water heater down a few degrees and we found they had a new unit with a digital thermostat. It was quite fancy and easy to adjust. We replaced some burnt out bulbs as well as some incandescent bulbs with CFLs. It was determined that the faucets and shower were flowing nicely. Ian, Ben, and I helped set up an improvised clothes line in her side yard. Apparently it was a life long dream of hers to have one, so it was nice to fulfill that. Ben also fixed the broken window in the garage back door. This house had 3 refrigerators and 1 large chest freezer, which is the same setup as Cindy’s house! Kind of strange, but we told her that she could consolidate her goods and unplug her extra refrigerators. She was worried that the refrigerators would break if unplugged, but we assured her that she would just save energy. We are getting much quicker at our energy audits and may soon be able to complete two in one day! The Next upcoming posts in the Health Section of the Herald will be on smoking and thoughtful eating. The former topic is sensitive, and we hope to approach from a hope-giving, understanding, and realistic perspective. It will complement/prepare the way for the 5 Day Stop Smoking Program in the middle of April. If any of you have any thoughts or experiences please comment.